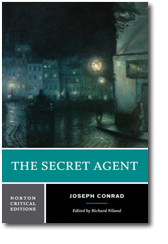 Joseph Conrad, The Secret Agent, Norton Critical Edition, edited by Richard Niland. London and New York: W. W. Norton, 2017. 386 pp. £7.95; $13.00. I admit up front that I have a good deal of affection for Norton Critical Editions, and I was excited to see that they were treating Joseph Conrad’s The Secret Agent to their tried and tested formula of authoritative text, background context, contemporary reviews, and critical accounts. Helming the venture, Richard Niland is an excellent choice as editor. With an earlier publication, Conrad and History under his belt, he is a highly experienced and respected Conradian scholar. One of the surprises of the volume, perhaps, is that it has not already appeared in the Norton series. While one of the contemporary reviewers (from the Baltimore Sun, in the US) in the Norton edition describes Conrad 1907 publication as “offal on the dust heap of literature” (232), that is hardly the canonical view. Peter Lancelot Mallios in his “Reading The Secret Agent Now: The Press, the Police, the Premonition of Simulation,” available in the volume, points out that in the aftermath of September 11, Conrad’s novel “became one of the top three works of literature most frequently cited in the American media” (347). While there is no arguing the contemporary fascination for the novel, long before that, F. R. Leavis in The Great Tradition unequivocally declared it “a classic and a masterpiece,” which perhaps begs the earlier question, why did it take so long for Norton to treat this iconic text? (209). Niland’s treatment of the novel makes available a rich trove of resources, especially for an undergraduate audience. The text itself is based on Methuen’s English 1907 first edition (with minor corrections/emendations). Explanatory footnotes are added throughout, dealing especially with historical contexts and Conrad’s evocation of his London setting. The volume’s background contexts section offers a wide range of resources, beginning with Conrad’s “The Informer,” from A Set of Six, historical critical coverage and a series of contemporary resources that contextualize some of the novel’s prevailing attitudes and ideas. There is no doubt much of value here, and it is often fascinating to see Edwardian reviewers responding to the novel. The Scotsman teases its audience with the gritty verisimilitude of the novel, telling them of an author with “unusually intimate knowledge” of the world of anarchists (224). The TLS presciently notes that Conrad’s treatment shows “how narrow a gulf is fixed between the maker of bombs and the ordinary citizen,” the kind of insight that keeps Conrad’s text so relevant to us, with the threat of radicalization of ordinary citizens such an ever-present feature of our modern psyche (225). Edward Garnett in The Nation predictably opines on Conrad’s illumination of the “secrets of Slav thought” (227), while the Baltimore Sun and other reviews remind modern readers of the novel’s lack of conventionality, and speak to its status as a Modernist text, as the reviewer in the Athenæum protests that the writer should “show some regard for the simple reader” (226). The New York Tribune, perhaps with half an eye on the US serial version of Conrad’s novel, which was a much truncated version of the final novel, argued that the book would have been better “rewritten. Materially condensed” (231). As the volume shifts to Contemporary Sources and Debates, there are some valuable resources that provide varied opportunities for mining historic texts: Conrad’s 1920 author’s note to the novel begins the section, followed by excerpts from Isabel Meredith’s A Girl Among the Anarchists, David Nicoll’s The Greenwich Mystery, Robert Anderson’s Sidelights on the Home Rule Movement, and Max Nordau’s Degeneration, along with a press account of the Greenwich bombing from the Pall Mall Gazette, and Peter Kropotkin’s description of anarchism from the Encyclopedia Britannica. There is much to commend here, and the selection teasingly illuminates Conrad’s subtle boast about “knowing a lot about [revolutionaries]” alongside his claim to “moments during the writing of the book when I was an extreme revolutionist” (237). The source texts tend to focus on anarchist contexts, with the sensational coverage (much of which turned out to be conjecture) of the Pall Mall Gazette’s exposé of “an Anarchist conspiracy, which it is believed will prove to be the most desperate and dangerous of any revolutionary plot that has ever had its headquarters in London” (238), followed by David Nicoll’s account of his suspicions of H. B. Samuels’s role as provocateur and police spy. This is followed by the sequence in the Meredith novel, where Myers (the Samuels figure) is caught up suddenly in an anarchist kangaroo court, only to be saved by his angry wife. The link with Fenian terror is suggested by the excerpt from Anderson’s memoir about the role of the police agent and the agent provocateur (like Coulon), in the new age of terror, and the whole is capped by an excerpt from the popular pseudo-science of Max Nordau outlining his theories of Degeneration. Ray, in his subsequent essay on Conrad’s familiarity with Nordau, denounces the popular text as “a silly book” in a refreshing and honest appraisal, but he also makes the case for Nordau’s text as both a source and a perspective. The worst that can be said of the section is that there are few surprises in it, and perhaps there’s an argument for a clearer rationalization of some of the editorial choices. Some of the contemporary sources are consistent with the lead essay in the criticism, Ian Watt’s “The Political and Social Background of The Secret Agent,” Martin Ray’s essay on Conrad and Nordau, and Michael Newton’s “Four Notes on The Secret Agent,” but then the selection moves on to Hugh Epstein’s “A Pier-Glass in the Cavern: The Construction of London in The Secret Agent,” and Gail Fincham’s “Empire, Patriarchy and The Secret Agent,” which argues that Conrad’s novel “substitutes class and gender discrimination at home for racial discrimination abroad” (345). If we try to bridge the Contemporary Sources and Debates section with the Criticism section there seems to be a disconnect. Watt’s, Ray’s and Newton’s essays echo aspects of the contexts section, but Epstein and Fincham take us into so-far uncharted territory. Epstein’s essay argues powerfully that Conrad’s vision of London was influenced by Dickens and Ford. Would, then, the contexts section be better with an excerpt from Ford’s The Soul of London, or Dickens’s Bleak House? Would it be better with something on the New Woman, or a contemporary feminist perspective, like Mary Austen to offer further context for an approach like Gail Fincham’s? The answer may not be yes – but the connections between the Contemporary Sources, and the critical perspectives would be clearer. Terry Eagleton’s engaging essay, “Form, Ideology and The Secret Agent,” almost provides the interpretive Rosetta Stone that bridges the critical differences here, with its description of the novel as “a complex amalgam of genres – a compound of spy-thriller, Dickensian ‘imaginative realism,’ ‘metaphysical’ meditation and (in a loose sense of the term) naturalism” (287). The problem with this volume is that it is a densely populated text already, with the 386 pages in a font that makes your eyes water a little as it is. It therefore seems unreasonable to argue that perhaps stories like H. G. Wells’s “The Stolen Bacillus,” or Arthur Morrison’s “The Red Cow Group,” might augment or replace Conrad’s short story which is more readily available. Perhaps the serial version of The Secret Agent’s finale (which is materially different from the novel) might be an interesting addition? Perhaps more importantly, Conrad’s letters are missing from the contexts discussion, with all the drama of the composition in Capri, Conrad’s fretting with his agent, Pinker, and the final race to meet shipping timetables for US mail, and provide magazine copy for Ridgway’s Militant Weekly’s publication timetable. Some of the issues here in terms of selection and focus would have been better served with a clearer sense of an editorial perspective. There is room for Richard Niland to add a prefatory essay, or note, which alerts the reader to some of the choices and points of focus. The lack of such guide means that we are left with a kind of Roshomon effect. Kurasawa’s film, based on Ryonosuke Akutagawa’s short story, “In a Bamboo Grove,” notably challenges its viewers with a series of competing perspectives of a moment of violence in a bamboo thicket. By the end of the story we have a series of perspectives of the violent act, but no way of evaluating their relative value – let alone determining truth. Of course, as a metaphor for critical engagement with a text, Roshomon is compellingly honest. Moreover, it is undeniably in keeping with the fractured nature of Conrad’s narratives. Would an undergraduate reader need more in the way of editorial guidance to a novel which Eagleton describes as “scooped out in the clash of its contradictions” (291)? I tend to think so, and I suspect that the text would have been better served if Richard Niland had offered an editorial key. Nevertheless, the Norton edition is a valuable addition for the modern reader, with an embarrassment of riches within its pages. It is a terrific, compact resource for the student of Conrad, or any reader hoping to appropriate some of the broader, and sometimes conflicted, contexts of a text that is more than a century old, yet continues to feel so modern.